commonsense The negative surprise of Axiata having to pay the capital gain tax of RM2.2bil from its acquisition of Ncell back in FY16 just add another layer of bad news to the already disappointing business outlook. This would potentially drag the company’s financial result to another loss in FY19 which will affect the sentiment of the market towards its share price. However, please take note that the core net profit would not be affected as the tax is a one-off event. Based on the 7 analysts covering the company, the average core profit for shareholders in FY19 is projected to be around RM1.25bil (however the reported bottom line would most probably be a negative of almost RM1bil if Axiata is forced to pay the tax on Ncell in FY19). At the current share price, this would already value the company at a valuation of 27.4x fwd PE. This is considerably high especially for a company that has failed to deliver the expected growth that investors were hoping for. The highest profit to shareholder was recorded back in FY15 (this is before they acquire Ncell) of RM2.6bil. Since then, the profit has fallen substantially with FY18 core net profit to be around only RM1.1bil, a fall of almost 60% from its peak profit. Even with FY19 expected profit of RM1.25bil, it would still be only half to what it managed to achieve back in FY15. If you are looking to diversify your portfolio outside of Axiata (due to its weak earnings outlook and relatively high valuation), I would recommend you to look at MBMR. MBMR is a direct proxy to Perodua via its 22.6% interest in the company. Valuation is cheap at only 7.0x PE (based on target FY18 profit of RM145mil. 9m profit is already RM106mil). PB is low at only 0.7x BV. 4Q18 results is expected to be higher than 3Q18 and last year's 4Q17. FY19 growth will be driven by the still high demand of the new Myvi and the newly launched SUV Aruz and also the newly revamp Alza in 2H19. The recent announcement of closure and potential disposal of the loss-making alloy wheel manufacturing business alone is expected to boost the company’s profit by an additional RM20mil. I am projecting a profit to shareholder of RM170 mil for FY19 which at the current price values MBMR at only 6.0x PE. TYS_Capital u can't avoid capital gain tax even in Malaysia, I guess is normal right for business. TYS_Capital I also pay taxes la,I guess tomorrow stock price up balik guo. this morning I terkejut u know, I thought losses or what. TYS_Capital should we call compensation or taxes? TYS_Capital 2 different things u know. banker33 got so many problem. BF Chin Today up.Tomorrow will drop to normal.This counter always like that....When you can change the way to up trend to your new record??? Heavenly PUNTER pew pew pew hollando bloom booom! apolloang what....lost so much yet 4.25....should be below 4.00,apa ini bursa no fundamentals at all ar? amet2017 Aiyo you guys dont read company profile aa..the shares owned by big boys with long term vision, not easy to manipulate. Go and figure the list of big boys. Very small portion ikan bilis play this counter. haiya..
wotvr This company should be below RM 1 by now. Alan Wong RUNNNNN!!!!!!!! Or left only underware next MON ...buy 3182 GENTING sure wont regret. Alan Wong bro sell all your cut loss AXIATA and switch to GENTING BHD 3182 instead bcoz QR announcement is very positive!!! beLIEve won't limit down la. the 3b loss is from 2 quarters ago, market already digested. the current 2b also one-off loss, not due to business bad. ceo also says good days ahead. tomorrow maybe will drop a bit due to knee jerk reaction. Alan Wong 3,000,000,000 = 3 billions ...how long to cover back? amet2017 People talked nonsense when they lazy to read. Whenever they read the result summary, they never bother to read the actual QR report. RM 1 ringgit? come on! Alan Wong RUNNNNNNNN!!!!! BLOODBATH AND CUT LOSS STARTS AT 9AM....READY SET GO! Alan Wong who dares to buy ???? i wonder who would like to catch a falling knife ....sorry its chopper! 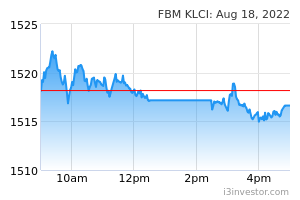 factorrumour woah... what the heck is khazanah doing? BETTER SELL AXIATA & GET OUT! !